HELP! How to level my garden out on my own? Hello everyone, nice to see there's a big gardening community I can finally reach out to! I moved into this property about 5 years ago and have always been too busy to tackle the garden. I'm a one lady army. I have 5 pet ferrets. The garden is in the sun from 10am to 8pm throughout the summer. Recently I have scaled back my working life to relax a little bit more and it's only now I can see just how bad my garden has become. The biggest problem for me has always been the two drains that is above and below the orange/red plant tray just slightly over on the right halfway up the garden on two different level. All my other neighbours were lucky enough to have a nice even gradual slope minus the two drains as I'm slap bang in the middle of my street. Last year I asked 4/5 landscapers to come round to give me a quote to level out / create a nice slope and put fresh turf down and they were all in the region of £3-5 thousands pounds. That's a fat no from me. I'd like to do this cheaply as I can and I'm in it for the experience. I have a few ideas and that was to dig the ground level further back toward the rear fence as close to the bottom drain and install wooden sleepers and build steps like the V formation so me and my dogs can walk up and down either side and it would give the garden an unique point of focus and create two even level. Doing this would give me the chance to lay down fresh grass turf on nice level ground and something that could easily be maintained by me and suitable for my animals. 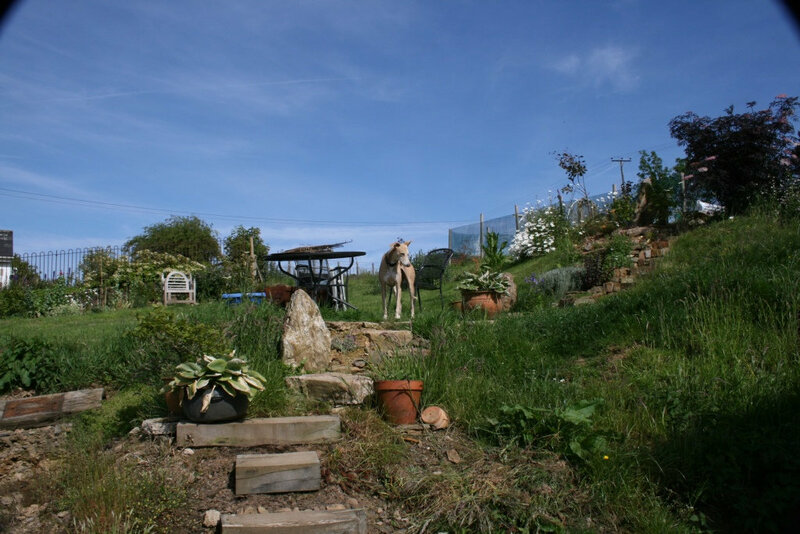 As you can see on the rear left of the garden, I did dig out a portion of the garden to see how big the gap would be from the bottom of the rear fence to my garden level which is around 3 feet deep however it does taper off toward the right rear of the garden. A new rear fence will be build once I have levelled off the rear garden to bring the height down in place for the new fence for privacy and security. The soil in the garden is very hard and it is filled with rubble, huge chunks of bricks and stone from when my house got built. Would a rotavator hire be suitable to get the ground broken up and bring as much rubble to the surface and enable me to start digging into the garden? Please give me as much advice as you possibly can! Thank you all so much and very much looking forward to seeing all of your threads and admiring your lovely gardens! Forgot to add, the washing poles are going to get dug up and replaced with a spinny wash line.. I don't actually know the official name for them Sorry! Haha! I'm sorry but I wouldn't know where / how to start doing that on my own - hopefully somebody else will be able to help. From the photo that is some slope you have there. The best way to deal with it would be terracing but IMO that's a job for a landscaper / builder or an experienced DIYer. Be aware that whatever you do you need to ensure the finished result is stable. Soil is heavy and heavy rain plus unstable soil could be dangerous. I'm afraid I can't quite visualise your plan so I can't comment on it. I'm a woman and I couldn't contemplate manoeuvring a rotovator safely on that slope. Also, rotovator blades don't like lots of bricks and rubble. Is there any access to the garden via a side path? You could look at the hire of a mini-digger for a few days to move soil around - but, again, it might not be safe on a steep slope. Just some things that spring to my mind. Sorry to sound so negative but I'm guessing that's why the landscapers fees seemed quite high. Hope somebody else can be more positive. Hello Topbird, Thank you for your advice! I thought it was just me! From all the other exampled of 'sloped' garden on these forums I certainly didn't come across one as bad as mine haha! oh dear! There is a side path indeed however the two point I wondered about was I told you needed to have a license to use a mini digger (I'm based in in Scotland) and I was worried about hitting the drain pipes, I've no idea how far deep it goes or what direction it goes in although I'd hazard a guess and say it does go left and right to my neighbouring houses. I have a "can do" or "everything goes" attitude, I tend to be overly optimistic, I don't worry much, I just get on with things and worry later (or never). I am also young, able-bodied and with a husband help if needed. AND I wouldn't do this. Honestly, I know you don't want to hear it but it looks like something extremely hard to do. First, the only option I can imagine for tackling this is terracing it. I don't think you can level it (as make it into a gradual slope) because plants want to grow up and soil gets eroded. Terracing is neither easy nor cheap. It also isn't a job for an amateur. Worse case scenario, the whole slope could collapse on you, taking your neighbours structures with it. If you want an easy solution, something more inviting than this but doable, I would start with steps and some small seating area in the upper part. I wouldn't try to do the rest as lawn, I would do wild flower meadow or something like that. 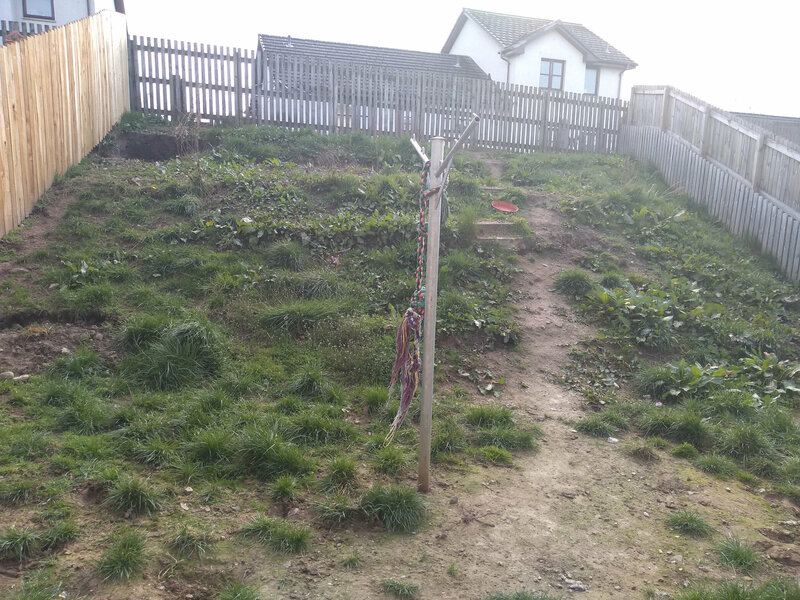 We once dug out a couple of small terraces in our sloping garden but I have to say its slope was nothing compared to yours! I agree with Topbird, I’d be extremely wary of using any kind of machine, single handed, on that slope. A couple of things occur to me. Are the dogs big or small, old or young and do they go for mad, loony runs or are they reasonably calm? (good idea using the washing line pole for the ‘raggies’😁). Will you have to keep to tough plants to avoid any damage? Do the ferrets have a run? Sorry I know nothing about keeping those. If it were me, I think I’d first of all try and visualise what you’d like as the finished article which is what you’re already trying to do, and then perhaps try and do a small terrace on that top level. Just to see how it goes. Because our terraces were quite low, we dug out the ground till it was level and then placed a decking board on its side along the edge to keep back the soil. For yours, I’d think about perhaps sleepers. We used pieces of wood to hammer in vertically behind/in front of the decking board so it didn’t slip forward and allow the soil to move down. Repeated for each terrace. However, as I said, our slope was gentle compared to yours. The drain could be awkward. I assume it’s concrete covering the pipe right across the garden (or maybe just where we can see the concrete in the photo?). When you get to that part I’d leave well alone and have plants trailing over it, dogs permitting. Steps....I’m afraid I can’t really help with any ideas for those. Maybe someone else can come up with advice. Hello @rolypoly2112 ; I admire your enthusiasm and l really don't want to rain on your parade, but that is one hell of a task ! My initial instinct is to terrace it, and if so make any steps as wide as you possibly can. However you decide to proceed, l wish you the very best of luck You've come to the right place for advice. In the interests of full disclosure, I should say that I am not on my own, and my OH does help me with some tasks (more of that in a bit) but with this particular story, I generally did it on my own or with the 'help' of one of my 3 rescue dogs. I don't have any ferrets. I am not sure whether the slope I tackled is quite as steep as yours, but the principle is the same, I think. It's about 4m from top to bottom and about twice that front to back. 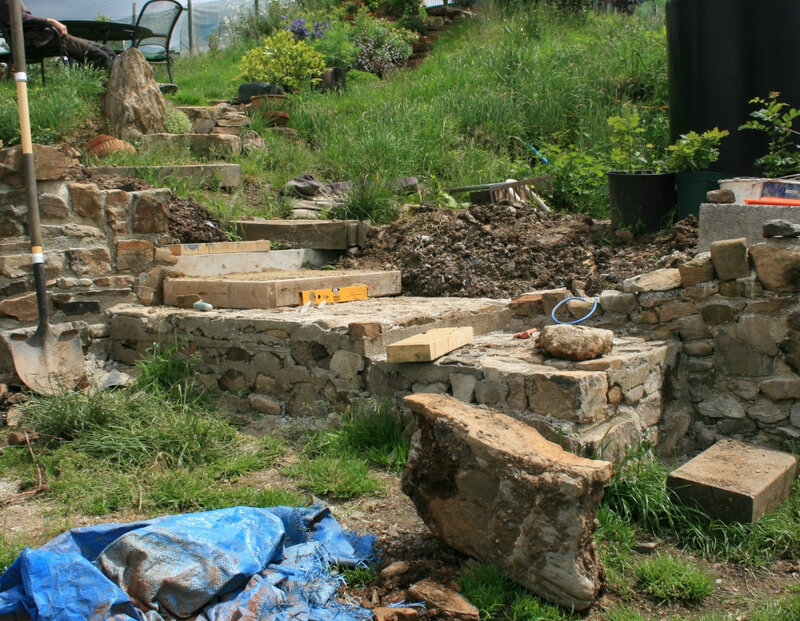 First I made some very rough steps out of old bits of concrete slab that were lying around - I could have used sleepers, stone, brick - whatever is easiest. Trying to work out a 'line' to make the path take. I was aiming for the line of fence posts, btw - so this was about half done. You would need to work out a line to give you a level 'step' on top of you drains - IME it takes a couple of goes to get it right so worth doing a rough and ready job to start and then you can fiddle with it. Then I did quite a lot of digging getting the soil to follow as well as I could the line/slope of the steps. Don't have a good photo of that bit but that heap of soil behind the steps disappears in the next ones. 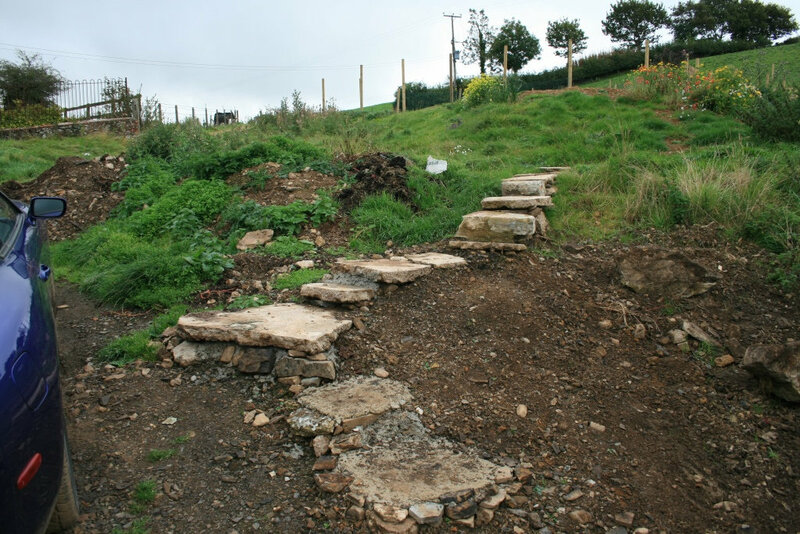 Then start to replace the rough steps with better made ones and build shallow terraces in line with them, never more than 6 inches high and about a foot wide, so there are no structures retaining any weight of soil. I used stone because it comes out of the ground here, and some off cuts of wooden sleepers that OH had but whatever is to hand. This is where OH took a hand and replaced the lowest steps with proper concrete ones, because he wanted to make a parking area at the bottom. 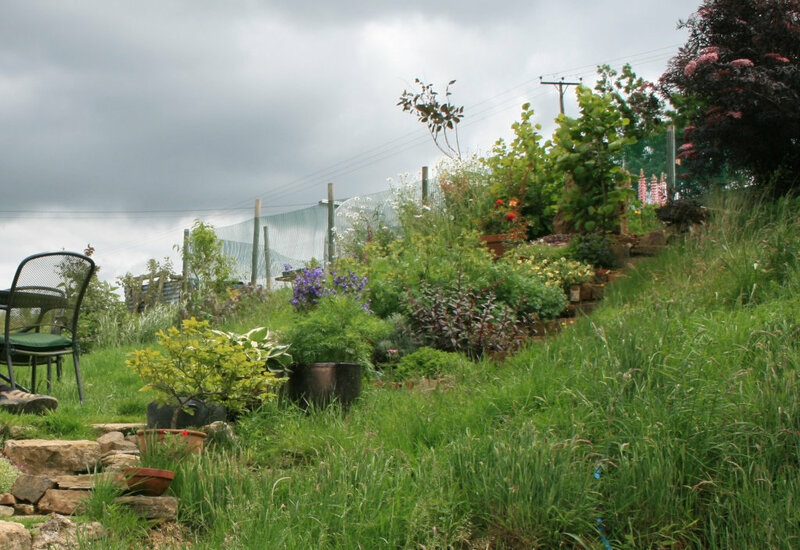 The planting was beginning to mature by this time and you can see that the grass is now growing well on the steep slopes to either side. 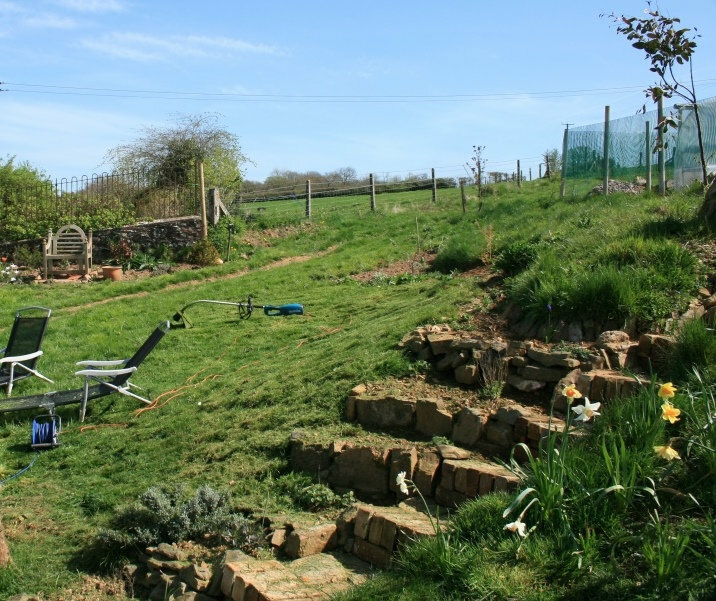 To be honest, the sloping grass is hard work to mow so it mostly gets strimmed instead and I have been slowly planting it up with shrubs and bulbs and other excuses not to cut the grass, but it at least keeps the ground stable. And apart from the steps at the bottom, it was all my own work and done with hand tools, not machines. It did take me two years - though not every weekend - our garden is actually very large and lots of other stuff had to be done while this was going on. You could make two wide terraces as you describe, but as has been said, the structures to make the terraces are not an easy DIY job on your own. You could take this less intensive sort of approach and do it on your own. Like the others. I think a slope like that is not doable by a one person army. What you might be able to is level a small area at the bottom of the slope first, so you can sit out. I believe you always work from bottom to top on a slope not the other way round. I also don't think you will be able to use sleepers as retaining walls because of transport and weight/length for one person. You might be better off using bricks and teaching yourself how to lay a small wall (DIY books - B & Q used to do a good one) or videos) 2 or 3 ft high, max). One you've got the lower bit done, then work on the next level and so on up to the top. Make any paths zig zag across the slope which would be safer that straight up and down. You might also have to think about safety rails on the steps. With three dogs, the garden I'm afraid is never going to look very tidy as they'll probably keep trashing any grass, plants etc. You could perhaps think about hiring somebody on a casual basis to help with the heavy work if finances permit. Have a look at what your neighbours have done for other ideas. Finally, if it all gets too much, you could always move.